Aren't these cards just gorgeous, I'm loving Michelle Zindorf's style and Judy had replicated that wonderfully in her cards. Judy is one of Megan's downlines. This is Trudi's page about her beautiful daughter Baylee at 4, what a little cutie! And the page isn't bad either.lol. To check out more of Trudi's stunning cards and layouts go and see her blog... Made by Me. What a gorgeous example of how to use some of the lovely items in the "Pretties Kit"
For more information on this layout go and visit her blog. This fabulous card is by the talented Tracy, you can see more of her creations at.... "Stamping Seasons"
Sarah Gough has just joined our team on NZSU and will be cruising your blogs regularly for Inspiration Cards. You can also find Inspiration on Sarah's Personal Blog thINKing Stamps. Don't forget you can help us out as well, if you come across a card that you think would be 'Inspirational' email me the link and I'll post it. Sharlene's been busy with these two gorgeous cards for the challenge. To see more of Sharlene's designs check out her blog HERE. PS - Don't forget to leave your comments, we love hearing from you and we know you visit. And for every comment you leave you get an entry for our Blog Candy to be drawn at the end of June. And this denim paisley card would be fantastic for any teenage girl. Sharlene made this card after spotting one similar in a magazine. I think it's a fantastic way to use a background stamp. Check out Sharlene's blog Stamp With Sharlene for more of her projects. Here's my card for SC#1. This set is such a great set for Masculine Cards. Hope you like it, I don't have the tab punch yet, so rounded the corners instead. Also there's lots of sponging, I'm really into sponging at the moment. Here's a Sketch Challenge (SC #1) for you all. It's the very first SC on Splitcoast. Hope you all have fun with it. Email me your creations with the Subject SC#1. I'll get onto mine this afternoon. Firstly I'd like to welcome Lou to the NZSU team, we're now a team of 2, Yay!! It'll be great to get some fresh ideas. Hopefully the blog will keep growing as SU grows in NZ. You never know, maybe one day we'll have our own NZ version of Splitcoast. Ps - Karen sorry it's taken longer than expected to post. Could you please email me a bigger pic if possible. Thanks. They finally arrived! My DEMOSINKNZ swaps and they are all just gorgeous! Joining swaps is a great way to build up your demo cards and to get new ideas. This swap was to design a card using the DSP from Palette 0' Prints Promotion. I loved all of them, but chose this one for Inspiration, it's stunning and it would be a great card to demo at a workshop. It was designed by Vicki Were who also organised the swap. Thanks Vicki for your hard work and for the card. Louise, of the blog PunknScrap is currently running a Colour Challenge and offering a prize of Blog Candy. So if you enjoy stamping, challenges and free stuff, give it a go, I will be! Here is a stunning Mother's Day card by Anne-Marie,. It was designed by Jacque and Anne-Marie put it together. This card is very cool as somehow it turns into a bookmark. For the recipe check out her blog by clicking on her name above. She's also posted some great note cards and recently had a colour challenge. Unfortunately I wasn't organised enough and missed but will definitely try for the next one. Here's Michelle's entry, lucky those who received this card as one of their Demosinknz swaps. Here's Sarah's gorgeous entry, a beautiful masculine card. Check out her blog thINKingstamps for her recipe and instructions. If anyone's noticed, this isn't the EXACT card on Michelle's blog. It's the one I made at her $2 card evening the other night. It was one of five cards we got to make and uses one of the Level One Hostess Sets. For more of Michelle's cards and her three sons latest antics check out her blog O 2 B Stampin. Here's my entry for the May Challenge. I love SU DSP, how everything co-ordinates, SU even tells you which colours co-ordinate with your DSP making it even easier, I used to spend ages trying to match papers and cardstock at the local scrapbook store. Just to let you know, each photo posted on the web featuring SU products needs to have the copyright stuff on it. 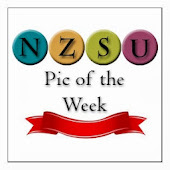 I'm happy to add the info when you email me cards to be posted on NZSU. If you want to know how to do it yourself, there's a tutorial on my blog HERE. Anyway here's Mag's entry, I love this set although I haven't gotten it myself. And her water colouring is lovely. Every time I check my inbox there's a new challenge entry and they are all fantastic. I still need to get onto mine. So here's entry using one of the new Hostess sets, I think SU have really stepped up their Hostess sets this time round. If you're a customer and want to know how you can get the Hostess Sets FREE contact your local SU Demo. PS - Tracy hope you weren't too cold today! Kim's been busy with her Wanted Set and Outlaw DSP and created this Gate Card for our May Challenge. For the full recipe go to her blog INKin Fun. I hope you find this inspirational. I wanted to share the card I made last night using the easy but very effective cracked glass technique. Check out my blog for details - Made By Me.